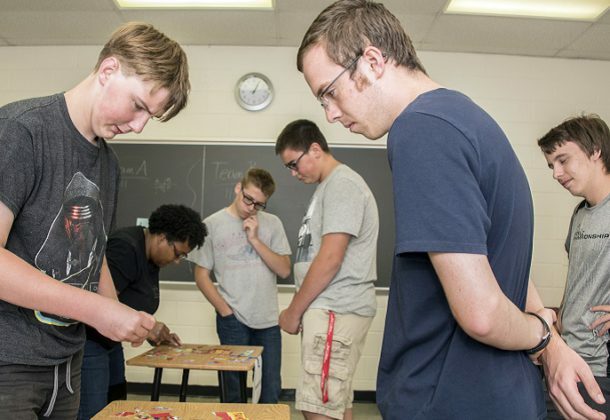 With programs such as Robotics, American Music, Personal Finance, Cybersecurity, and Environmental Science, the College of Southern Maryland‘s Summer Scholars Academy will give high school students the opportunity to take an in-depth look at an area of interest while earning college credit. Designed for rising junior and senior high school students, the summer academy program is an opportunity for outstanding high school students to take a three-credit college course that blends traditional on-campus classes with extended learning activities that are designed to prepare participants for college success. The program offers five different academies from which to choose. Robotics, American Music and Personal Finance academies will be held from July 9-26. Cybersecurity and Environmental Science academies are scheduled for July 30-Aug. 16. Applications are now being accepted. “Content-wise, it’s everything. It’s really good … It is time-intensive, and it is a lot of work,” said Brandon Durham of Waldorf. CSM increased the academies being offered this year, including the addition of the Environmental Science Academy. CSM Chair of Biology and Physical Sciences Jean Russ said the academy is designed to provide an interdisciplinary approach to understanding the environment and related issues. The American Music Academy will give area high school students an opportunity to make an intensive study of the broad history of American music from colonial times to the rise of rock and roll and contemporary styles. “I am particularly excited that the students will be exposed to a variety of musical styles important to the history of the United States, such as jazz, gospel, blues, country music, Latin-American music and Native American music,” said CSM Chair of the Division of Communication, Arts, and Humanities Dr. Stephen Johnson. Students will also have the opportunity to learn about careers pioneered by Americans such as songwriting, sound recording, performing, and music criticism from guest speakers in those fields. “This course will be of interest to both those interested in pursuing their interests in music and those who simply would like to learn more about the fascinating history of American music,” Dr. Johnson said. The Cybersecurity Academy introduces students to the CSM cybersecurity degree program at CSM, essentially replicating the first course in the degree, according to CSM Chair of the Business and Technology Division Professor Bernice Brezina. “Students will work hands-on in the computer lab as they work on computer hardware, tackle operating systems, security and network connectivity issues and troubleshoot computer systems,” Ms. Brezina said. Students who are considering a business career may want to consider the Personal Finance Academy, which is designed for students to gain financial literacy and learn how to make money management decisions. It may apply as an elective course in the Accounting or Business degree programs,” Ms. Brezina said. “Students will gain a broad, practical overview of personal financial skills including budgeting, banking, credit, taxation, investments, insurance and estate planning,” she said. The Robotics Academy is designed to appeal to both newcomers to the subject as well as students who have a background in robotics, according to Assistant Professor Byron Brezina. “The Robotics Academy will give students the opportunity to learn the basics of robotics or expand their existing skills in a hands-on summer camp environment,” he said. To apply for the CSM Summer Scholars Academy, students must complete and submit the online application and provide their high school transcript and a letter of recommendation from a high school teacher. An academic average of 3.0 or better is required. Admission is competitive and contingent upon space availability. For information on CSM’s Summer Scholars Academy, click here.